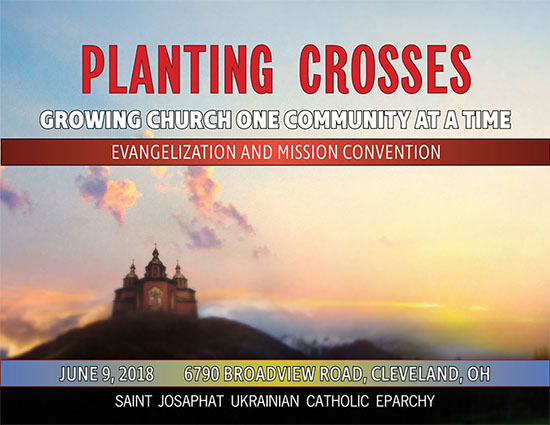 Over 120 delegates from the Ukrainian Catholic Eparchy of St. Josaphat in Parma and beyond gathered together on June 9, 2018 at the Pokrova Ukrainian Catholic Church in Parma, Ohio (USA) for an eparchial convention. The convention, presided over by Bishop Bohdan Danylo, Eparch of the Ukrainian Catholic Eparchy of St. Josaphat in Parma, focused on parish renewal and how to establish new missions in regions of the eparchy where our Church is not yet established. The speakers this year included Fr. Mark Shuey, administrator of St. Nicholas Ukrainian Catholic Mission in Raleigh, NC, who has been pivotal in establishing new missions in St. Josaphat Eparchy; Fr. Alex Wroblicky, a priest of the Ukrainian Catholic Eparchy of St. Josaphat in Parma from Pittsburgh, PA; Fr. Jason Charron, pastor of Holy Trinity Ukrainian Catholic Church in Carnegie, PA and of Our Lady of Perpetual Help Ukrainian Catholic Church in Wheeling, WV; and Fr. Joseph Matlak, administrator of St. Basil Ukrainian Catholic Mission in Charlotte, NC, who is currently also trying to establish new missions in the State of South Carolina. The convention also included a panel of delegates from various parishes and missions in the eparchy, who were able to share with the participants their unique experiences of being members of the Ukrainian Catholic Church, which was met with attentiveness, appreciation, and enthusiasm. Over the last decade, St. Josaphat Eparchy has grown, both in members and in the establishment of new mission-parishes. Missionary priests, deacons and lay faithful have gone out into the vast eparchy and established eleven new mission-parishes in North Carolina, Tennessee, South Carolina, Georgia, and Florida. And a new outreach has recently been started in Pennsylvania as well. There is a desire present in the eparchy to continue to grow – a true call to worship. The delegates, during their discussions, were reflecting, among others, on the following questions: how can our parishes grow from maintenance to mission? What can we do to help support the growth of missions? How can we best provide ongoing formation for our faithful that inspires them to reach out beyond their comfort zones and evangelize others? “All of these challenges lie ahead of us,” stated Bishop Bohdan, “yet we know that with the Lord’s help and the zeal of our people that I saw visiting our parishes and missions we can go forth and spread the “Good News” of our Lord and Savior Jesus Christ to every corner of our vast eparchy and beyond,” concluded the hierarch.